Kolam is also otherwise known as Rangoli. It is very famous in India and especially during the festival season people decorate their house with interesting Kolam designs. 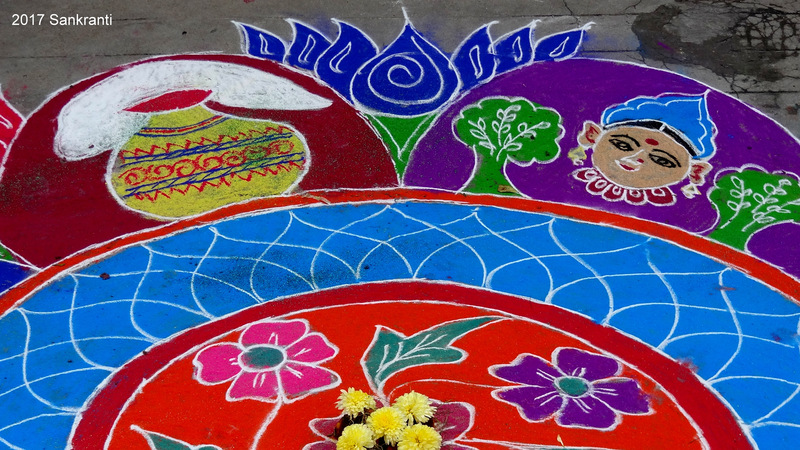 Rangoli or Kolam is a huge topic to write. There are both cultural and traditional aspects as well as well being associated with the Kolams that are drawn in front of the house. Kolams is actually very famous in Tamilnadu especially during the month of Margazhi. 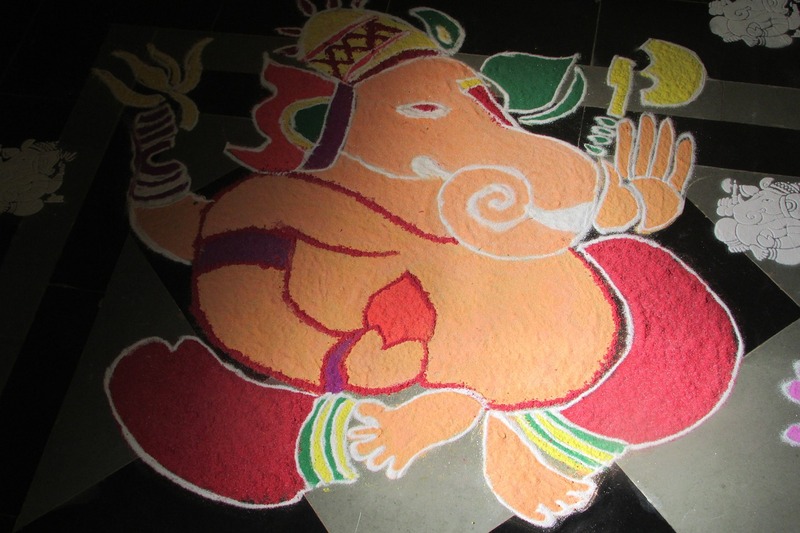 People use Rice flour to draw the Kolams along with colours to make it more attractive. It is also common in Kerala where they even decorate it with flowers as well. That practice is not very common in Tamilnadu. Ladies in the house usually wake up early in the morning and spend a lot of time in drawing Kolams in front of the house. This Kolam is usually drawn every single day in front of the house in spite of having any festival or not. But especially during festivals and special occasions, the Kolam designs will be absolutely amazing because the members of the family spend lots of time on this particular activity. It will be both colorful or just in white color alone. Drawing Kolam in front of the house is also kind of a hobby for the ladies in the house and they take lots of efforts to draw Kolams. In a joint family with lots of people, you will also be able to see training and practice sessions happening. In Indian culture and espcially in South India this is given a huge importance. It adds lots of significance to individual as well as family. I will try to cover in detail about each significance in a seperate post. But for now I would like to highlight some of the points about the significance of Kolam designs. Kolam is an excellent stress buster for the people in the family. Every day morning ladies in the family spend a lot of time decorating their house with Kolams. This also brings unity among the ladies in the family. While doing Kolams, ladies usually discuss various things in general. This also acts as a casual knowledge sharing session among the ladies in the family. 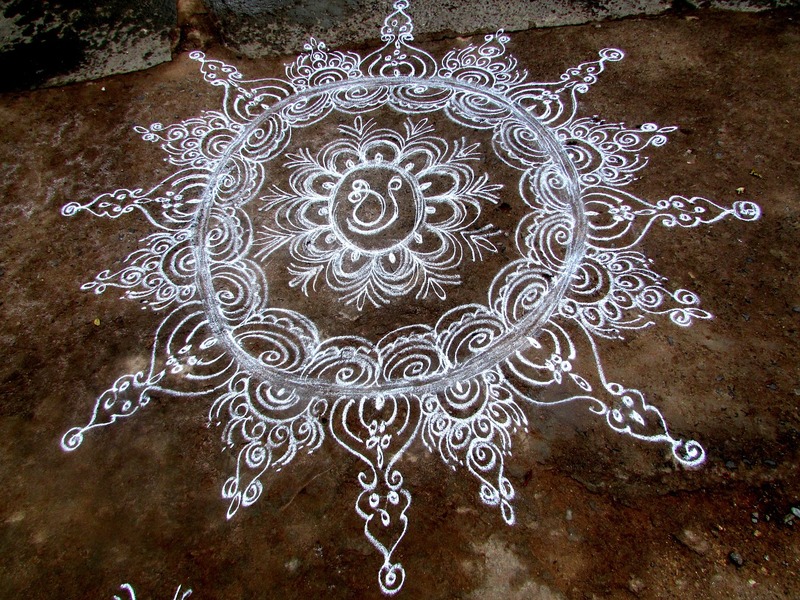 Kolam is usually drawn with the help of rice flour. The main reason for using rice flour is because after the Kolam is drawn small insects and ants feed on these Kolam flour. There are also few small birds that feed on these rice flour. There are some complicated patterns in advanced Kolam designs that help in improving the problem-solving capabilities of the ladies in the house. I can go on and on with the significance of Kolams. People also try to say some social messages through Kolams. It sometimes creates awareness among people who walk by the road. The best part I admire the most is that the Kolams that are being drawn in the house becomes a food for insects and ants. That is what makes me feel so much attached with this tradition. Yesterday night I went for a movie, night show and I was returning home at around 1:30 pm. I noticed so many people working really hard in drawing Kolams in front of their house. It will mostly be ladies and only in rare cases it will be gents. I was quite surprised to see in some places where the whole family was awake until they complete the giant Kolams. The only mistake that I did was that I did not capture any of the Kolams in my mobile camera. They seemed to have so much of fun during this activity. Most of the Kolam drawings had a Pot for Pongal and sugarcane near it. That is the right symbolic representation of the festival. Some drawings even had cows and bulls in the designs. It was also very colorful and quite interesting to watch all the designs and reach home. When I was about to enter my house, my mother also had drawn a Kolam in front of our house. Next time when there is a festival, I will try to click some pictures of the Kolams and write an article about it.